The savvy consumer—that’s you—knows that the 2018 Chevrolet Equinox and 2018 GMC Terrain are essentially the same vehicle under their sheet metal. Both are available with a trio of 4-cylinder engines, including a high-mpg turbodiesel, and they can both be ordered with front- or all-wheel drive. Although they have many similarities, they’re unique on the road and each has its own value story to tell. We lean toward the Terrain, which justifies its modest price hike with more sound deadening and better interior materials, even if its quirky shift buttons and poor over-the-shoulder visibility are demerits. Both crossovers seat five and are new for the 2018 model year and start around $25,000. The 2018 Equinox and 2018 Terrain are available in four trim levels—L, LS, LT, and Premier for the Chevy and SL, SLE, SLT, and Denali for the GMC. Dollar for dollar, the Terrain generally runs between $500 and $2,000 more than the Equinox, so shop carefully. You’ll find far more expressive styling on the Terrain with its gaping maw up front and “floating” rearmost roof pillar visible from the side and the rear. It’s polarizing, but GMC deserves credit for breaking out of the blocky approach seen on the last Terrain. The Equinox, meanwhile, is evolutionary, with only a more pinched front fascia and van-like taillights separating it from the outgoing model. A 1.5-liter turbo-4 good for 170 horsepower is standard, while a 2.0-liter turbo-4 that puts out 252 hp is on the options list. 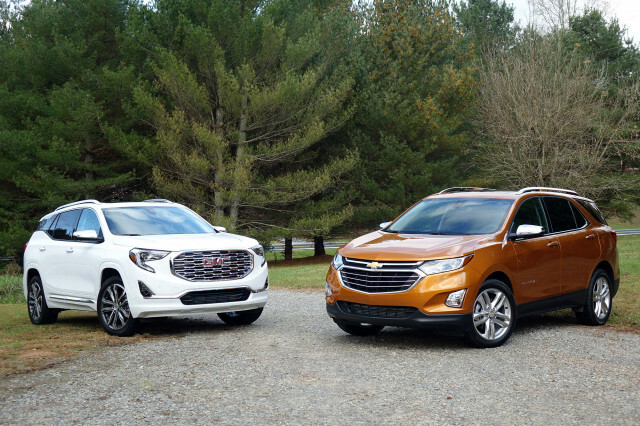 The vast majority of Terrains and Equinox crossovers are fitted with the 1.5-liter—it’s the same engine in both crossovers, but the GMC gets a trick 9-speed automatic transmission while the Chevy uses a lower-tech 6-speed automatic. Oddly, there’s a highway fuel economy hit with the GMC’s 9-speed: with all-wheel drive, it’s rated at 28 mpg, while the Chevy’s 6-speed comes in at 30 mpg. Both earn the same 26 mpg combined, and we think the GMC’s smoother shifts are worth the modest fuel economy hit. But our money is on the optional 2.0-liter turbo-4, which pairs to a slick-shifting 9-speed automatic on both the Equinox and Terrain. It furnishes robust acceleration and a driving experience that comes up just short of the zesty Ford Escape and Subaru Forester. There’s also a 137-hp, 1.6-liter turbodiesel inline-4 that delivers up to 39 mpg on the highway but it struggles to motivate either crossover. Moreover, the turbodiesel is rated to tow just 1,500 pounds, while the 2.0-liter can lug 3,500 pounds. Both crossovers ride softly, especially with the 17-inch wheels standard on lower trim levels. Opting for the larger 18- and 19-inch units firms things up, but not to the point where either is punishing over rough terrain. Light, accurate steering makes both crossovers easy to drive around town, but there is more lean into corners and a less athletic feel to those two crossovers than you’ll find in some rivals. On the highway, the Equinox and the Terrain track well. The GMC’s additional sound deadening measures hush the outside world better; the Chevy is surprisingly loud. Inside, these two crossovers diverge even further. The Equinox is curvier with its gentle dual cowl-like dashboard giving way to a standard 7.0-inch or optional 8.0-inch touchscreen infotainment system. Taking up considerable real estate in its center console is a conventional gear lever. We can’t say the same about the Terrain, which instead forces drivers to look down and tug buttons toward them to select a gear. Going between park and drive isn’t a chore, but selecting a lower gear for engine braking while you descend a hill requires a lengthy look away from the road. Clearly, the Terrain presents the solution to a problem nobody was having. 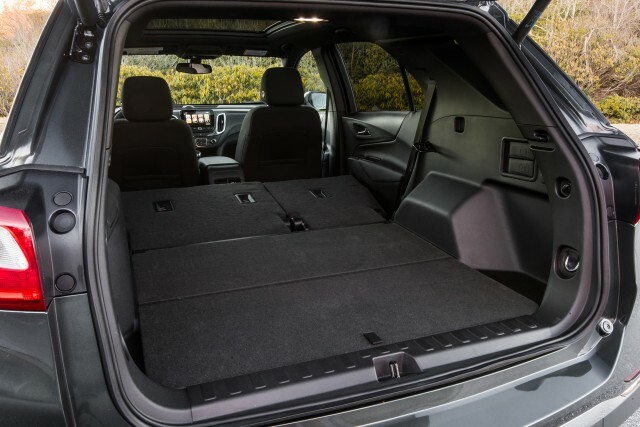 Despite that setback, the Terrain’s interior is otherwise the winner here, with more use of soft-touch materials and French stitching scattered about. The matte metallic and faux wood touches look suitably upscale even on the base Terrain SL. 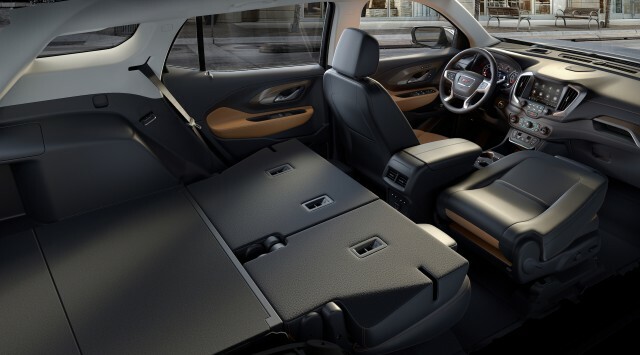 Both crossovers have comfortable front seats and good rear seat room for two. Three abreast in the back seat is a challenge for adults; outboard passengers will find their heads pushed into the headliner and their backs resting against the edge of the seat. 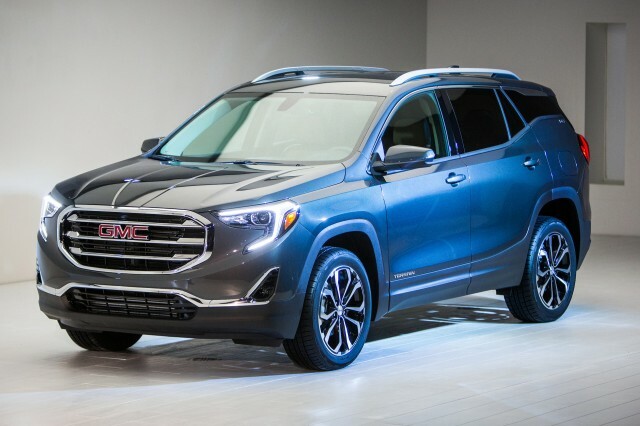 Aside from the 9-speed automatic standard on the Terrain in place of the Equinox’s 6-speed, the two crossovers are outfitted about the same at the base level with keyless ignition, Apple CarPlay/Android Auto compatibility, and a rearview camera. Neither crossover’s base trim level is available with all-wheel drive, however, so snow-belters will find another big disparity. An Equinox LS with all-wheel drive runs a hair over $28,000, while a Terrain SLE sets back buyers nearly $31,000. 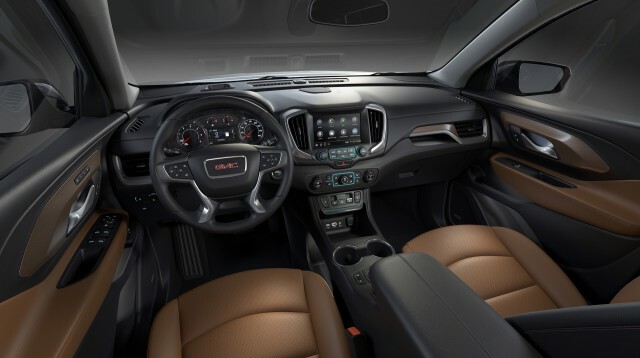 Short of a leather-wrapped steering wheel on the Terrain SLE, there’s not much else you’re missing. One note: GMC charges $395 for most paint colors other than white, while Chevy only levies an extra charge for a few hues. If leather seats are on your must-have list, the tables turn. 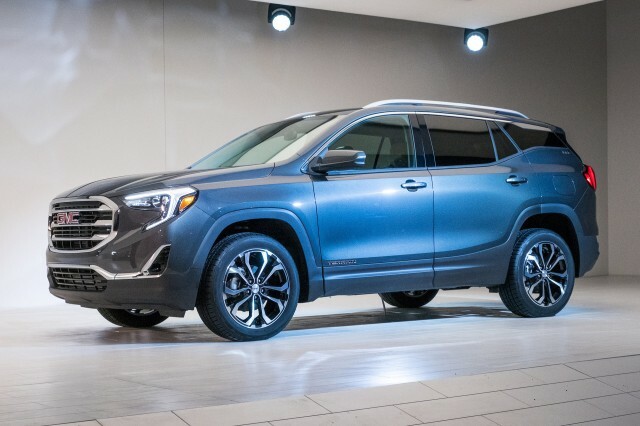 A Terrain SLT with all-wheel drive comes standard with leather, dual-zone automatic climate control, and heated front seats for about $34,500. 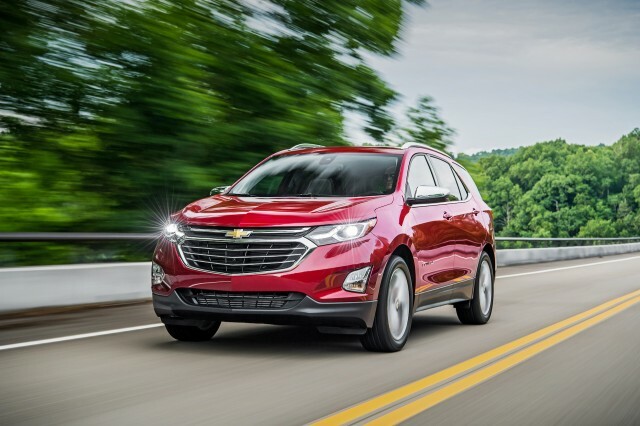 To get the same on an Equinox, you’ll have to step up to the Premier trim level with its power tailgate and rear cross-traffic alerts for around $1,000 more. In our eyes, safety is also a major selling point. 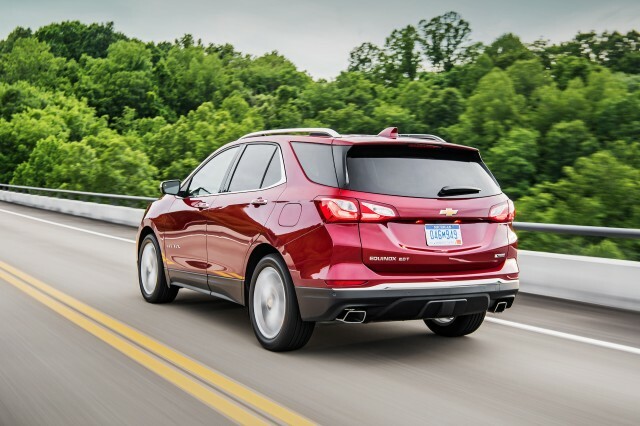 The least expensive Equinox with automatic emergency braking is about $1,300 less than an equivalent Terrain. Make sure to specify the Driver Alert Package II on either crossover to get the most advanced safety tech—something rivals like Toyota, Honda, Subaru, and Mazda make available at a much lower price point. Finally, a loaded Terrain Denali lists for more than $44,000. It’s equipped like a luxury crossover, but it’s also priced like one. The sensible choice here is a modestly equipped 2018 GMC Terrain with either turbo-4 gas engine. Pop for the Driver Alert Package II, but be careful digging too much deeper into the options list and you may want to look at some rivals, too. 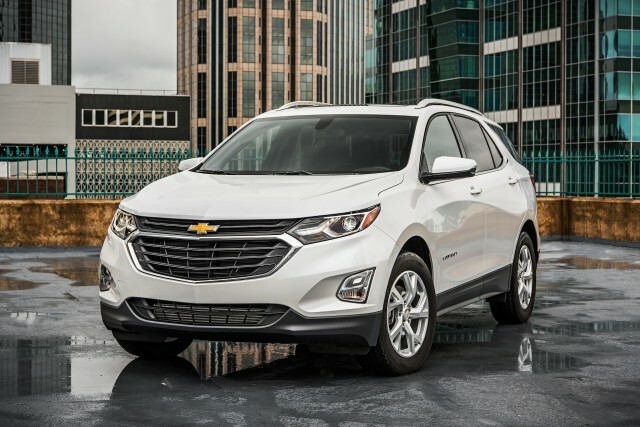 The 2018 Chevrolet Equinox is a needed step forward for the brand and a solid compact crossover. The 2018 GMC Terrain tucks into a jazzy new body, and boasts a great new turbo-4 drivetrain, but needs to spread its safety message farther, and wider. Updated in every way, the 2018 Equinox makes strides inside and out. The 2018 GMC Terrain steps back from ultra-macho sheet metal, and slips into something a little more sleek. A trio of turbocharged engines firmly upgrades the Equinox's offerings, and a turbodiesel should make things interesting. The 2018 GMC Terrain sports turbo-4s and 9-speed automatics that give it smart acceleration to go with its sound handling. 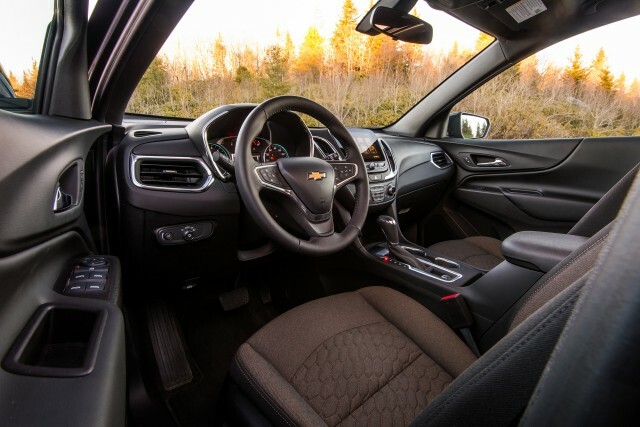 A plush ride and better seats go far, but the best Equinox is still the most expensive. The newly downsized GMC Terrain lacks a sliding second-row seat, but still makes the utility grade. The 2018 Chevrolet Equinox earns good ratings by the IIHS and NHTSA, depending on when it was built. The 2018 GMC Terrain awaits crash tests; we’re waiting on GM to make more safety features more widely available. Updated infotainment and better equipment bring the 2018 Equinox up to speed with the competition. The 2018 GMC Terrain ladles on premium features in Denali trim; some critical safety tech skips the affordable trims. The Equinox isn't as efficient as some, but the optional turbodiesel is quite thrifty. With a frugal new turbodiesel on board, the GMC Terrain’s fuel economy has never been better. There are no Chevrolet dealers in our network that are located near the ZIP code. There are no GMC dealers in our network that are located near the ZIP code. We have sent your request for price quotes on the 2018 Chevrolet Equinox and 2018 GMC Terrain to the dealers you requested. They should be in touch shortly. Your request for a fast, free price quote on a 2018 Chevrolet Equinox and 2018 GMC Terrain is in process. The CarsDirect Dealer(s) listed below will contact you shortly to discuss your request and to provide a quote.